When trying something new, you want to learn what works and what doesn’t as quickly and cheaply as possible. As Steve Blank says, a startup is a temporary organization in search of a scalable and repeatable business model. In other words, early-stage ventures exist simply for the purpose of running experiments to validate their hypotheses. Public Innovation has reached a critical stage where we have come to realize that the business model we put forth last November is neither scalable nor repeatable. This is not to say we’re not generating revenue. But rather, the business model upon which our social impact model rests is flawed. Because tech – and, specifically, civic tech – is experiencing such explosive growth, we set ourselves on a path to sell technology services as our core revenue base. We always knew that it would take at least a year to ramp up our operation, build up our sales pipeline, and prove our value proposition to potential customers. But what we didn’t anticipate was the fundamentally wrong approach we established to sell services that we provide. In particular, we tacitly positioned Public Innovation as a custom web application development shop without realizing the consequences of that choice. The challenge with this approach is the voluminous amount of customer interaction and project management that must occur for projects to succeed. Even practicing agile development, we’ve found ourselves spending double the hours budgeted while charging half the hourly rate we should. This has left zero time (and resources) for us – as an organization – to focus on our social impact model. How might we change our model? Well, it turns out that startups generally don’t do custom app development. Instead, startups focus on developing a single, minimally viable product. That’s the most practical path to achieving scalability and replicability. This epiphany seems, frankly, stupid for us to have not realized sooner. But hindsight is 20/20, right? And there’s an even larger issue that looms in the background. Community Organization or Civic Startup? Let’s assume that we can fix our business model by shifting to a software as a service product focus (yes, we can). A new tension will emerge that challenges our ability to drive regional impact. Specifically, pursuing a civic startup model means that our revenue growth will be driven by our ability to offer our services outside of the region. Again, this will drain our internal capacity. Another hard lesson we’ve learned is that there are many existing organizations that are already doing good work across the Sacramento region. And these organizations ostensibly empower people with tools to help them create the change they want to see, as well as benefit from the current allocation of philanthropy in the region. However, we wouldn’t have a social impact model in the first place if we didn’t think there was an opportunity to accelerate measurable progress. Until we can better position Public Innovation as having unique and valuable core competencies, we fear the perception of competing over finite resources and duplicating efforts. Yet, a significant portion of our work will require grant funds or other sources of philanthropy to be sustainable. While we would have liked to learn these lessons sooner, a pivot is still feasible for us. In the coming weeks, we’ll be developing a prototype platform to add capacity to collective impact efforts. It’s something that we know is needed and that we know how to build. The question will be whether it’s something for which a sufficient number of customers will pay. Stay tuned. We're halfway into the first month of 2014, so now's a good time to reflect on what we've learned since publishing our business plan last November. Let me put this in no uncertain terms: regional leaders love what we're doing. I was initially skeptical, to say the least, but there's a growing realization that our theory of change is needed. Does this mean we've made it? Nope. But what it does mean is that we're plugged into a network of influencers who are committed to our success and the ball's in our court to strategically tap those individuals when the time is right. Oh, and I should also mention that our international web traffic often surpasses our domestic hits. I wasn't in this space when it started, so I'm not a credible source for the history of civic tech. I spent the early part of my career working toward wholesale policy changes, a.k.a. "reform." I got involved with civic tech, frankly, because Public Innovation's goal to make the Sacramento region a global leader in public sector innovation needed a revenue model that didn't rely on playing the lottery for grants. Although there's some criticism of the methodology, the Knight Foundation's report on civic tech identifies $431 million in investments between 2011 and 2013. It's both a revenue source for us and a good strategic fit. In my conversations with civic technologists, government professionals, and regional leaders, there are widely differing views regarding how civic tech should be developed. Many of the folks who work in this space do so out of a sense of civic purpose and under the auspices of volunteer organizations. On the flip side, government doesn't know how to procure free technology and the lack of project management sometimes lessens civic tech's impact. Yet, the civic tech space is so large that the opportunities far exceed the number of people who want to play a role. But the tension between what should be free and what should be fee-for-service still needs to be worked out. Civic Tech: We work with clients on a contractual basis to develop software that solves a problem within their organization and they give us money in return. Social Entrepreneurship: We want to launch an incubator program to help more people in the Sacramento region become social entrepreneurs. Organizational Development: We also want to recruit public servants and nonprofit professionals with the explicit goal of helping them change the internal culture of their organizations. Community Building: We occasionally bring people together to problem solve and help launch civic projects. In the process, we're hoping to create a constituency that supports risk-taking and experimentation in government. We believe that this suite of activities will create a civic innovation and social entrepreneurship ecosystem in the region—the corollary being that they're interconnected and shouldn't be done in isolation. Not only is the civic technology space booming, but so is the civic innovation space, more generally. We're seeing more civic incubators popping up across the country and even university-supported curricula being developed. These programs are backed by institutional investors, so it's incredibly difficult to keep with just a small two-person team. While we're currently earning revenue, it still feels like we're in the Valley of Death. Our plan to survive is to stay as focused as we can on the civic tech component of our model until we're able to grow. At Public Innovation, we're passionate about video as a medium for telling stories. While we would've loved to produce much more content this year, bootrapping doesn't exactly avail itself to the time intensive process of shooting and editing high quality video. But, luckily, there were some great videos this year that offer an assortment of lessons and inspiration for anyone working in the civic innovation space. Rafa Galeano: What is Innovation? Last Monday, California Forward, Hornets Policy & Politics Alumni, the Sacramento Chapter of the American Society for Public Administration and the League of California Cities held a forum on entrepreneurship in government, celebrating the 20th year of Ted Gaebler's best-selling book, Reinventing Government. Editor's Note: We haven't blogged in a long time. That's because it hasn't been a priority. After all, ideas are only as good as the number of people influenced by them. And without a substantial readership base, it wasn't worth the time to share our thoughts with the world. But we recognize a major trade-off resulted: namely, we lost our voice and the opportunity to share our insights with those of you interested in what we're doing. So in the coming weeks, look for that voice to return and brace yourself for a fresh perspective in the civic innovation space, along with some authentic candor. It almost goes without saying that new ventures fail for one of two reasons: either they run out of (1) money, or (2) time. 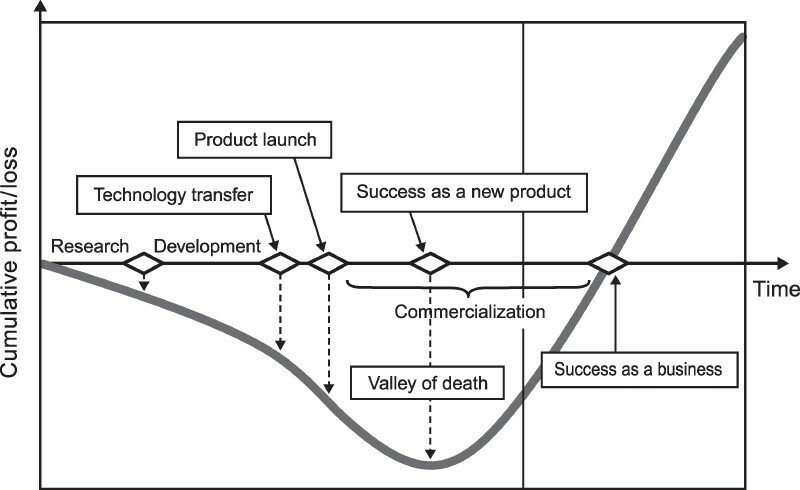 In the world of entrepreneurship, the period prior to a firm achieving profitability is known as the Valley of Death. Regardless of whether or not a startup is capitalized early on, it must eventually generate sufficient income to cover its costs in order to become financially sustainable. In the case of Public Innovation, we've received zero funding in the 17 months we've been doing our thing. That is, we've been 100 percent bootstrapped (a.k.a. self-funded). Guy Kawasaki discusses the value of bootsrapping on his blog and some associated strategies. Our reasons are simpler, however. Plain and simple, we weren't sure about the path we wanted to pursue, much less the specific business model we would eventually develop. All we knew early on is that Sacramento is ripe for a more innovative public and social sector. Bootstrapping is a great way to manage ambiguity. Rather than being accountable to investors for specific deliverables at pre-determined intervals, we were able to take a more inductive approach to developing a plan on which we know we're capable of delivering. And our only deadlines were self-imposed, allowing us to take as much time as we needed. But bootstrapping comes with a serious price tag. We've essentially established an organization and pursued a comprehensive set of activities without requiring revenue to cover our costs. In other words, we've given away our services and created a public expectation that we'll continue to do so. And the personal sacrifices have not been insignificant. Now that we've published our business plan, it's time to sell. Yet, we'd prefer to focus on creating value. Sacramento is a transactional place and there's no immediate economic benefit to be had by investing in Public Innovation. Similarly, waiting for foundation money to drop down from the heavens is a long shot. It's one thing to identify an unmet need; quite another to find paying customers. In recent weeks, an immediate opportunity to launch an incubator program for social entrepreneurs has presented itself. If we went forward with it, the program would be the first of its kind in Sacramento. And it's also a revenue opportunity for us. But the major challenge is the order in which we ought to pursue such opportunities. This is the art of sequencing. It only makes sense that we demonstrate some progress in the fundraising space prior to recruiting aspiring changemakers to help them develop their own social enterprises. There are also civic technology earned income opportunities, but those come with lengthy procurement cycles and we'd likely need to compete with better-positioned companies. Last but not least, there's substantial infrastructure we still need to build to streamline our lean operation and other important organizational development activities to set ourselves up for success. The reality we're dealing with is that most people don't value the risks entrepreneurs make. Just as true, is the fact that most new ventures fail. Even social entrepreneurs deal with grief. We'll do all we can to prevent ourselves from flying blind, but the bottom line is we need buy-in from influencers who can evangelize on our behalf and connect us to potential funders.